Even as the Aam Aadmi Party (AAP) national convener, Arvind Kejriwal, sought to project himself as a leader conversant with Punjab and its issues during his road show in Ludhiana, the candidates of the Congress and the Akali Dal continued trading charges. Will Mr Change’s broom vroom? Now, there are 22 candidates in the fray for the Ludhiana Lok sabha seat. The Returning Officer today issued the election symbols to all candidates. Some of symbols, such as “green chilli”, “mixie”, “gas cylinder”, “cot”, “battery torch”, are interesting. The various cadres of teachers working in government schools of state were hopeful that they will receive salaries after March 31. But even after the end of the fiscal year a large number of teachers are still deprived of salaries. Some of the teachers had not been receiving salaries from last seven months. Though the administration has set up three night shelters in the city for the poor, these remain empty most of the times these days. A few persons (around 60), who use these night shelters, said the night shelters were a great help during the winters while in summers, people preferred to spend nights in the open. Social activists, however, said thin occupancy at night shelters was because of a poor state of the “rain baseras”. They allege the authorities have neglected these night shelters and no facilities were provided there. The Aam Aadmi Party's road show turned out to be a pain the neck for commuters. Traffic jams were witnessed at various places in the city. Expressing resentment over the 'opportunistic' behaviour of senior politicians changing loyalties frequently, office-bearers and activists of various organisations have decided to remain aloof from election campaigns of candidates. Contrary to expectations of leaders, traditional gusto for the election campaign will be missing among farmers in the ensuing Lok Sabha elections. 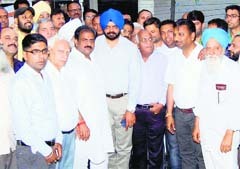 The activists of Private School Parent’s Wing today observed hunger strike at Jagraon Bridge seeking implementation of Right to Education Act (RTE) and action against private schools for fee hike. "Stress can cause cancer," said cardiovascular and cardiothoracic surgeon Dr Naresh Trehan, who is also the chairman and managing director of Medanta Hospital in Gurgaon. Employees of Christian Medical College and Hospital lamented that some unidentified persons took away a patient's dead body without paying bills this morning. The Anti-Copying Teachers' Front stated that allegations levelled against a school headmistress turned out to be true. The headmistress is accused of collecting funds from students. Dayanand Medical College and Hospital along with South Asian Society for Sexual Medicine today organized 'Andrology Symposium' which was attended by 300 delegates from India and Pakistan. The symposium was inaugurated by the chief guest Dr Rupin Shah, president, SASSM, who lauded the efforts of organising members in making this conference a grand success. A 35-year-old woman was killed after being hit by a truck on Gill Road here this morning. The deceased has been identified as Ranjit Kaur, a resident of Mair Colony in the Daba area. An MSc-I student was injured after he was allegedly attacked by a group of five students at hostel number 7 of Punjab Agricultural University late Thursday night. Khanna Police claimed to have solved the murder of a youth of the city in 24 hours and arrested a person allegedly responsible for the murder. The alleged accused was identified as Vicky Shukla, a resident of Khanna. The body of a youth was found on Lalheri road area. The deceased was identified as Mika (22) was an auto driver. The police arrested a person and recovered fake currency notes worth Rs 9,000 from his possession. The arrested person was identified as Mani Bhushan, a resident of Bihar and who was a head cook of a chicken centre of GTB Market, Khanna. The Punjab Athletics Association (PAA) will hold trials to select state contingents (boys and girls) at Guru Nanak Stadium on April 15 from 9 am onwards. Gurmeet Singh from Khanna clocked 34.56:04 minutes to finish ahead of others in the gruelling 10,000m race in the Open Ludhiana District Athletics Championship that concluded at Guru Nanak Stadium today. Chhinder Singh (36.06:57 minutes) and Rohit Kumar (37.48:78 minutes), both from Ludhiana, followed him to secure the second and third positions, respectively.